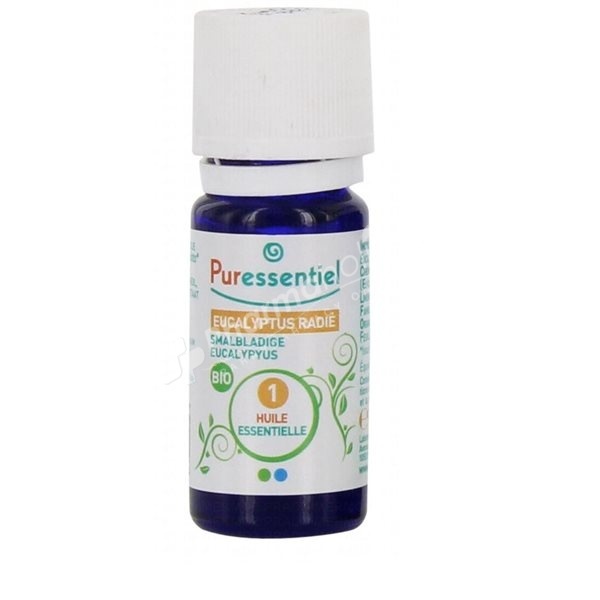 Puressentiel Eucalyptus Radiata BIO, HEBBD essential oil, 100% natural and pure.Anti-viral, anti-bacterial.Boosts the immune system.Clears the respiratory tracts.Expectorant: helps to get rid of phlegm associated with productive coughs.Calms running noses. The organic essential oil of Eucalyptus Radiata promotes comfort of the airways, the bronchi and throat. It is ideal for treating infections of winter and prevent the flu. Its antibacterial and decongestant used to stimulate the immune system and prevents contamination during virus outbreaks. It can also be used for a massage by acting on the muscles and stimulating blood circulation. In addition, four essential eucalyptus oils that exist, it is the only one that can be used in babies. Organic essential oil, certified resulting from organic farming by ECOCERT. Do not use pure without mixing with water. Internal use: 2 drops in honey, olive oil or on a lump of cane sugar under the tongue, 3 times a day. External: Used in massage or as a spray. Eucalyptus radiate, chemotype, cineole, eucalyptol, terpineol, lominene acetate terpenyl. Like all essential oils, narrow-leaved peppermint oil is forbidden during the first 3 months of pregnancy. It should not be used during breastfeeding either. On the other hand, it is remarkably well tolerated by children, including babies.